Greek Cuisine is the forerunner of European Cuisine and has a long tradition.It is said that the first cookbook recorded was created by Greeks.The cuisine makes excellent use of seasonal ingredients and it is said that tomatoes and other veggies taste best when in Greece.Greece the 'Hellenic Republic ' as it is known is well developed right from early times what with its ancient civilizations and its contribution to various fields like Administration,Art,literature and even food. The culinary tradition has inspired even neighbouring Italy,Southern France and even the Middle East as well.If the triad of 'wheat,wine and olive oil' formed the basis of ancient Greek Cuisine then the current culinary tradition brings into mind the kalamata olives,the thick yoghurt,the salty feta and Baklava. AWED - A Worldly Epicurean's Delight an event originally by epicurean DK of Chef In You,takes you through a wonderful journey through world cuisines.The current stop is Greece and lets celebrate Greek cuisine all this month with its delicious vegetarian menu. Make any Greek dish -vegetarian (eggs are allowed in AWED) /vegan and post the same in your blog.Feel free to use the logo. 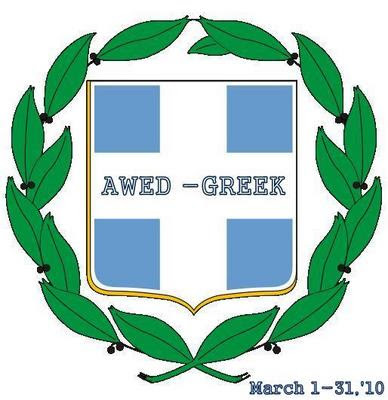 The logo is based on the National Emblem or the Greek Coat of Arms. Multiple entries are welcome,since more the entries,more the choices available. All the entries between March 1st 2010 and March 31st 2010 are eligible for the event. and several other droolworthy blogs/sites some giving even the detailed history behind the Greek Food. This is a simple vegetable and pasta soup from the island of Corfu in the Ionian Sea. The dish which I adapted from here makes excellent use of veggies and can be made with whatever veggies you have in hand along with pasta to obtain a hearty comforting meal. Spaghetti: 1/2 cup + broken into small pieces. Put all the chopped vegetables in water and cook till tender.Add in tomato paste,little salt,pepper,olive oil ,chili flakes and boil for five more minutes.Add in the broken pasta (I just halved the spaghetti),and cook till aldente or done. The soup was a chunky broth of pasta and veggies.Simple yet hearty and a nice starter soup if served in small bowls.There goes my first entry to AWED:Greece. Wow wat a lovely cuisine, i really want to explore greek cuisine, thanks for choosing, will send my entries soon..
love it how you cook around the world and introduce us to new dishes and new names! I love greek food.Nice theme for this month.Will definitly send you something. Interesting never cooked Greek definitely this one will push me to send u soon! I'll keep this contest in mind. At any rate, I'll love seeing everyone's entries in the round-up. Ivy, thanks for the kind mention, I will try and contribute a dish. Thanks so much for linking to my blog. You can count me in for your event. Sounds great! I am in! Can the entry be a sweet dish also or savoury only? Thanks for all the hearty comments and waiting for your aweome entries. Simple and satisfying soup recipe. You have nice collection of varied soups. sorry another question is dairy such as milk allowed? Just sent in my entry. Thanks so much for hosting. Hi ,My first time here.you have such a wonderful blog.A wonderful theme--Never tried greek recipes.As today is the last day for the event it's too late for me to participate,but sure will come back to see the various dishes from the round-up.